From the coastal plain upon which Barrow sits, the route enters the rolling limestone landscape of the northern margin of Morecambe Bay and twice strays across the higher ground of South Cumbria’s Low Fells on its way to Grange-over-Sands. 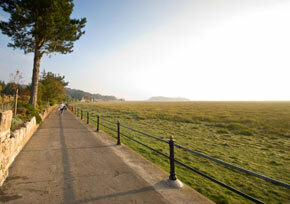 Ulverston is an attractive market town on the Furness Peninsula. 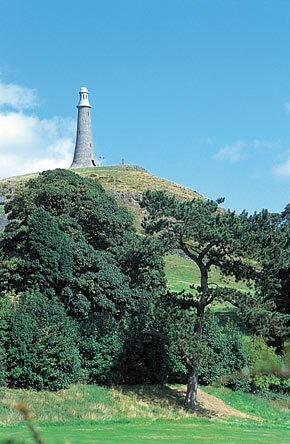 The lighthouse shaped monument to Sir John Barrow (Secretary to the Admiralty and founder of the Royal Geographical Society) on Hoad Hill leads you to the town, which has plenty to offer, including a cycle shop. With a choice of places to stay, you could easily make it your first night’s stop with a late start from Walney Island, but do allow some time to explore the cobbled streets, yards and ginnels busy with speciality shops and a wealth of eating places from cafes to restaurants even if you’re just passing through. Street Markets are held twice weekly with Thursday being the busiest day. There is an indoor market hall open every day except Wednesday and Sunday. Another citizen of whom the town is rightly proud is Stan Laurel, world famous comedian and movie star; the Laurel and Hardy Museum tells the story of the lives of Hollywood’s famous duo. Ulverston has a varied and exciting programme of concerts, theatre productions, events and festivals throughout the year. 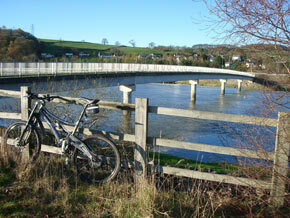 Spend an extra day in Ulverston to choose from five circular cycle rides in the town’s Cycle & See guide. This, together with leaflets on local walks, and more information are available from the Tourist Information Centre. Significant as the crossing point of the River Leven and where you enter into the Lake District National Park along a stony track. There’s a possible diversion into ‘Swallows and Amazons’ country from just before Greenodd (mile marker 17) following the River Crake upstream on the new and not yet fully signed Regional Route 37. It’s about 5 miles to get alongside Coniston Water and a further 6 miles to reach Coniston village. Some of the buildings you’ll see at Low Wood near Haverthwaite (mile marker 20) were once a gunpowder factory and workers cottages. It’s a hard climb up from Low Wood over High Brow Edge, but you’re soon rewarded with the descent into Cartmel, a great little place to stop for a picnic or something more substantial, bought either from the shop that sells the heavenly sticky toffee pudding or in one of the numerous pubs and restaurants centred on the attractive market square with it cobbles, water pump and fish slabs. The church is most of what remains of the twelth-century Augustinian Priory and has some spectacular stained glass. You can bed down in the bunkhouse at the racecourse (the place is packed on race days), camp at a nearby farm or get B&B at several spots. This Edwardian seaside resort could also be an enjoyable overnight stop on a more leisurely trip. If you’d like to enter via the promenade with fine views across the bay to the Arnside & Silverdale AONB, then turn right down Cart Lane almost immediately after you’ve turned left at the bottom of Cartmel Road. The path goes alongside then under the railway - strictly speaking there’s a local byelaw prohibiting cycling on the promenade, but it’s plenty wide enough for considerate shared use. Off the bike there’s a good walk to the top of Hampsfell (about 4 miles) with a 360 degree view from the summit. The Tea Guild voted the Hazelmere Café & Bakery Top Tea Place in 2006; it’s right on the route on the station side of the town. Contact the town’s Tourist Information Centre for more information.